Do you love to wear nail polish but have to remove it again and again for ablution or just left them wearing altogether? 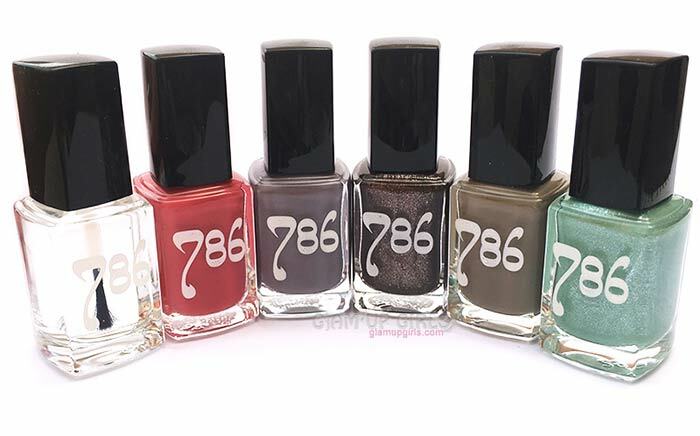 If yes then don't worry any more, few brands have come up with the idea of breathable, wudu friendly nail enamels and today i am going to share one such brand called 786 Cosmetics. 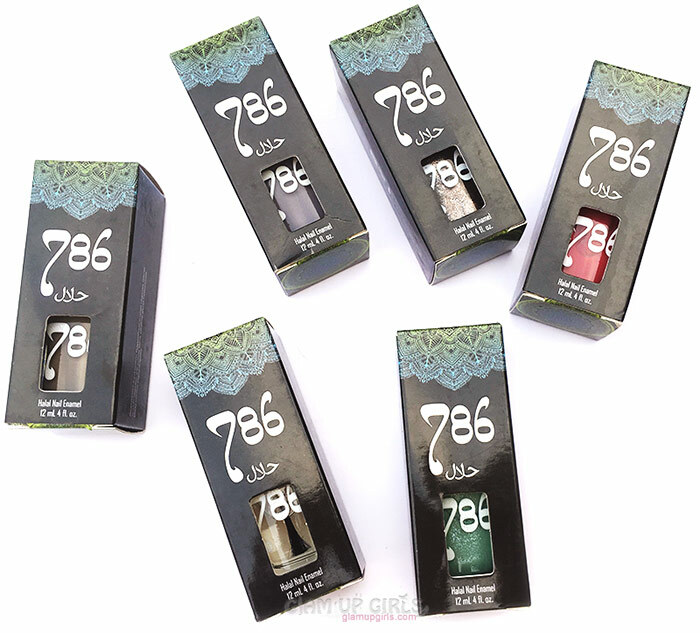 786 produce cruelty free halal nail enamels claiming them to be made of only halal ingredients from which water can penetrate and so acceptable as wudu friendly. Lets talk about the shades i got and their quality. First of all i love the packaging of these nail polishes box which are made of black cardboard box and have lovely Moroccan style flowers printed on top and bottom which give them a traditional touch. You can find ingredients detail and description on box as well. Nail enamels are housed in square glass jar and black cap with brush applicator. Brush applicator is slim and is perfect to apply nail color properly. The texture is same for all nail colors with slight difference in different shades. It is not very thick nor runny and you can apply them easily. Apart from five nail colors i also got top coat for protective layout to nail colors. Lets talk about each shade separately. Fez described as a sparkly light turquoise and is inspired by the stunning blue, mint, and turquoise tile work you’ll find in Fez, Morocco. 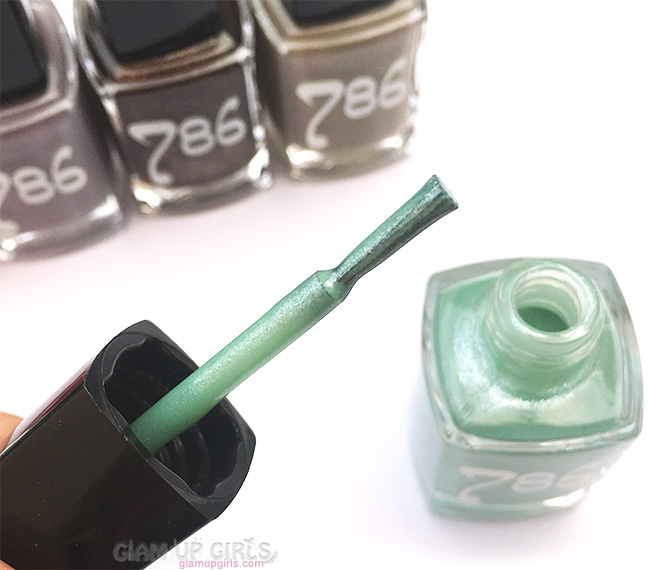 It is a beautiful minty shade with silver sparkles. I have applied 1 coat on pinky finger, 2 coats on index and middle finger while 3 coats on ring finger. You can see that in fist coat it gives little sheer coverage and then can be built further however i loved it in first coat as well. The texture is very moderate perfect to apply smoothly. The glitter is not chunky and even without topcoat it gives smooth surface instead of grainy which some glittery nail polishes gives. Granada described as a grey toned lavender, perfect for any season and is inspired by Alhambra Palace in Granada, Spain which has gorgeous gardens coated with lavender. I loved this beautiful shade and it is perfect to pair with one of my favorite ColourPop ultra matte in Cheap Thrills. It gives opaque coverage in first coat and you can still build it further with more coats. The texture is little thick then Fez and Cairo but still applies evenly. Doha describes as a warm and neutral taupe color perfect for any occasion or any outfit. This gorgeous color is inspired by the “Jewel” of Qatar, Doha. It is perfect neutral color for every one and i can see my self reaching it more often specially in winters. Its texture is similar to Granada and is very easy to apply. It is also opaque in first coat and can be built further. Jaipur described as perfect blush pink. Inspired by the beautiful Indian “Pink City,” the color represents the terracotta pink walls of the buildings. It is a lovely shade of bright medium pink and will look really good on all skin. Its texture is similar to Doha which is easy to apply and spread evenly. All shades with good texture are quite long lasting and without top coat can stay for two to three days without chipping if handled carefully. With top coat it can stay for longer. It gives streak free finish and it takes few minutes to dry first coat then you can apply further coats. Following is the water permeability test of these nail colors. 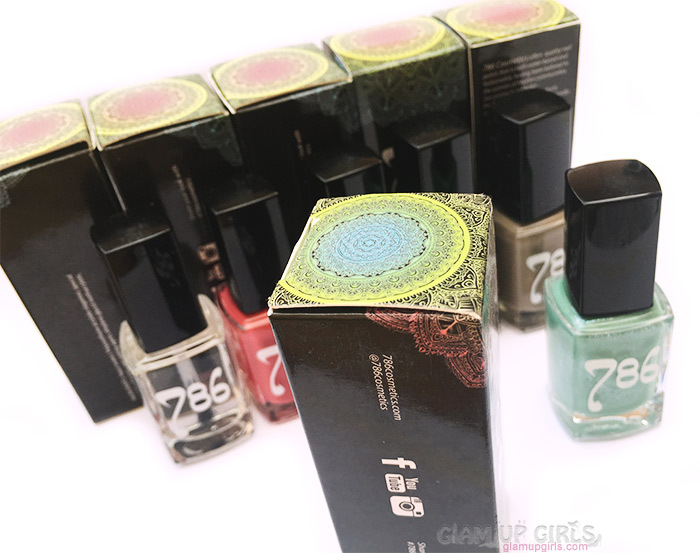 Overall i loved the quality of these nail enamels, the colors are absolutely gorgeous with good finish and lasting power. The other fact for these nail enamel is that being breathable they also protect your nails from discoloring as they let pass oxygen as well while other nail paints can cause the nail color to turn yellow if wore for longer.